You can leverage the power of impelLaunch by including it in your cloud-built SOE images. Please visit our SOE Portal page for more info. Most businesses have the need to deploy software to end-users. In many cases, investment in a software (or configuration) management solution has been made (e.g. Dell KACE, Microsoft Intune, Microsoft SCCM, or Altiris), or Active Directory Group Policy is being used. However, these solutions have varying limitations and the need to enhance application deployment often arises. impelLaunch has been designed to get around many of the limitations found in business environments. 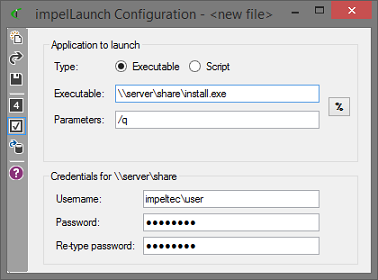 impelLaunch can be used to launch a program, commonly an application installer (e.g., .exe, .msi) or a script (e.g., .vbs, .wsf, .ps1). It can be run manually, from a system (or configuration) management solution, in a custom script, or used in the task sequence of an operating system deployment. impelLaunch has a full set of straightforward instructions embedded in the Help pages of the application. If you are using Microsoft Intune to deploy desktop applications, you’re likely to have encountered a few limitations. Firstly, you can only upload setup files with an .exe or .msi extension. This rules out any custom installations handled by scripts, or just the ability to simply deploy a script to make configuration changes to a device (e.g. registry). Also, if you have limited bandwidth, you may find Microsoft Intune ineffective in the distribution of large applications (e.g. AutoCad, Adobe Creative Suite or Microsoft Visual Studio). While BranchCache could be enabled to somewhat alleviate the need for multiple devices to download a large application from the cloud, this can still put significant load on network bandwidth. BITS can be enabled, but a large application may still take a very long time to reach a user. 1. Microsoft Intune can only deploy an application for which the source files have been uploaded. 2. Microsoft Intune will deploy an application in the system context. The system context, while having administrative privileges on the local computer, will not likely have access to network resources such as DFS shares. Read more about Microsoft Intune here.